Take a big bite out of the KFC Breakfast Buffet all weekend of July 2014 at participating stores. 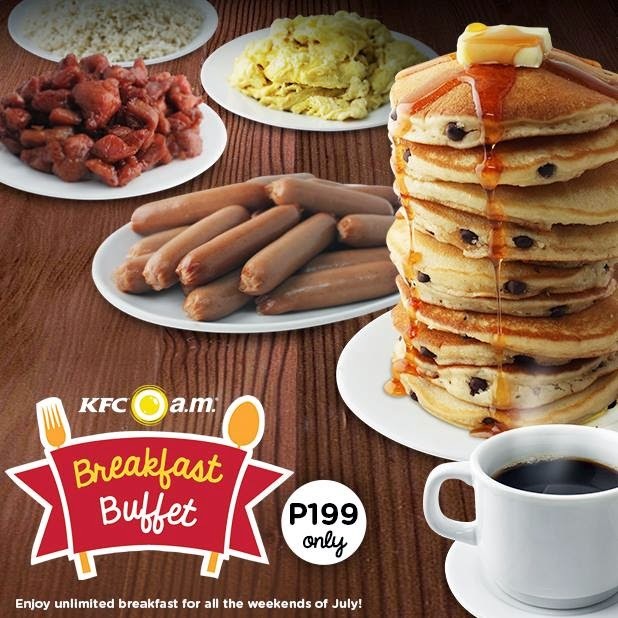 For only Php199 per person and Php99 for kids between 3-4 feet (free for smaller kids), you can enjoy a full morning meal of chocolate chip pancake, longganisa, tocino, chicken fillet with steak sauce, egg, garlic rice, arroz caldo and so much more. Unlimited drinks of apple juice, orange juice, coffee, and hot chocolate are also included. For the complete details including participating store locations, dates, and all information needed, click here.